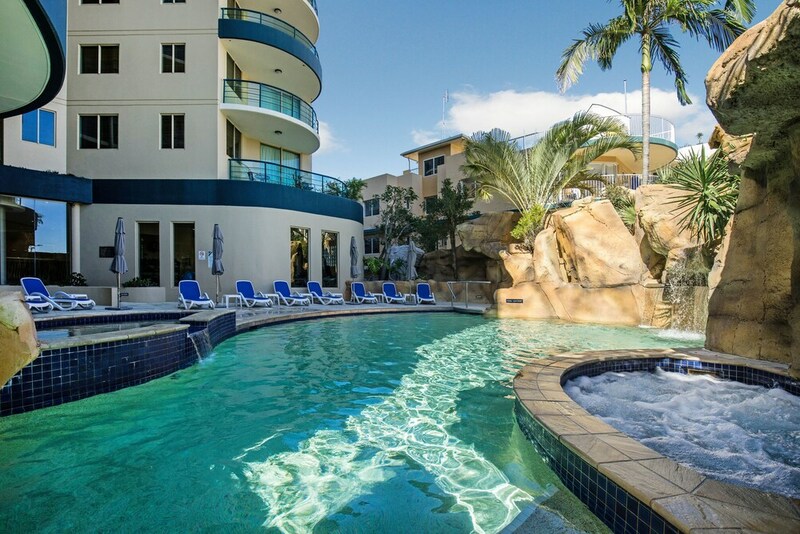 With a stay at Landmark Resort, you'll be centrally located in Mooloolaba, walking distance from SEA LIFE Sunshine Coast and close to Mooloolaba Beach. This 4.5-star apartment is within close proximity of Mooloolaba Esplanade and Point Cartwright. Make yourself at home in one of the 115 individually decorated guestrooms. Rooms have private furnished balconies or patios. Complimentary wireless Internet access keeps you connected, and cable programming is available for your entertainment. Private bathrooms with shower/tub combinations feature complimentary toiletries and hair dryers. Relax at the full-service spa, where you can enjoy massages and body treatments. You're sure to appreciate the recreational amenities, including an outdoor pool, a spa tub, and a sauna. Additional amenities at this apartment include complimentary wireless Internet access, tour/ticket assistance, and barbecue grills. Featured amenities include complimentary wired Internet access, luggage storage, and laundry facilities. A roundtrip airport shuttle is provided for a surcharge (available on request), and free self parking is available onsite. In addition to a full-service spa, Landmark Resort features an outdoor pool and a spa tub. Wired and wireless Internet access is complimentary. For a surcharge, a roundtrip airport shuttle (available on request) is offered to guests. This luxury apartment also offers a fitness center, a sauna, and a rooftop terrace. Complimentary self parking is available on site. Landmark Resort is a smoke-free property. An outdoor pool and a spa tub are on site. Other recreational amenities include a sauna and a fitness center. The onsite spa has massage/treatment rooms. Services include hot stone massages, body treatments, and manicures and pedicures. A variety of treatment therapies are provided, including aromatherapy and hydrotherapy.